In the mid-1980s, Joe Fiedler was a jazz student at the University of Pittsburgh, studying the trombone bible according to J.J. Johnson under the tutelage of hard-bop legend Nathan Davis. A math nerd, Fiedler enjoyed the puzzle of chord substitutions, but he felt he was missing something. Then, late one night, as he was driving home from a date, he heard a recording on Public Radio International’s Jazz After Hours that changed his life. At a pizza joint in downtown Baltimore, Fiedler, now 52, grins at the memory. A tall man with gray sideburns, wearing glasses, jeans and a blue-and-white print shirt, he exudes the modesty of an underdog. Despite a deep catalog of impressive recordings and collaborations with Cecil Taylor, Andrew Hill, Anthony Braxton, Maria Schneider, the Mingus Big Band and Eddie Palmieri, he has never won much renown outside the world of avant-garde jazz. Later that evening, Fiedler leads the quintet from the recording through a tour date at Baltimore’s armchair-filled jazz venue, An Die Musik Live! On “Maple Avenue Tango,” off the new album, Michael Sarin’s drum mallets and Pete McCann’s shivering, film-noir guitar set up the jaunty melody, introduced by Fiedler and saxophonist Jeff Lederer. After McCann plays a slo-mo guitar solo over bassist Rob Jost’s tango syncopation, Lederer and Fiedler engage in a call-and-response duet, trading eights that stay close to the theme. By the time they’re trading fours, however, they’ve digressed into free improvisation that only obliquely echoes the tune. Soon they are soloing simultaneously. At An Die Musik, tunes such as “Tuna Fish Cans,” “Guiro Nuevo” and “Quasi…” are built atop Latin rhythms, even if the themes and solos sound little like those of a Latin dance band. Nonetheless, those pulsing patterns open yet another door for audiences to approach the challenging sound of avant-garde jazz. Fiedler’s Afro-Cuban influence resulted not so much from an aesthetic choice as from the exigencies of making a living as a trombonist in New York. He had had some experience playing salsa in Pittsburgh, and when he moved to New York in 1993, he found that Latin gigs paid a lot better than free-improv ones. With his job writing and arranging the incidental music and underscoring for Sesame Street, Fiedler enjoys more economic security these days. That work and the Palmieri gig enable him to spend more time composing for his quintet, his trio and Big Sackbut. 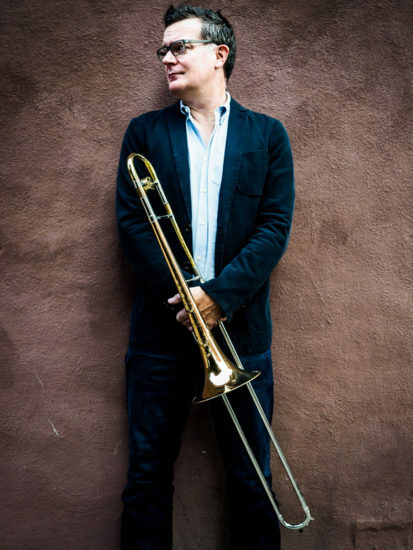 In addition, the Jeff Lederer-Joe Fiedler Quintet (with bassist Nick Dunston, drummer George Schuller and vocalist Mary LaRose) will be touring New England and Portugal this fall. In all of these projects, Fiedler is searching for new ways to combine tradition and innovation.